Gyeongju is a living history book with well preserved relics of the Silla dynasty matched in harmony with the natural scenery. In 1979, UNESCO listed Gyeongju as one of the 10 most important historic sites in the world. 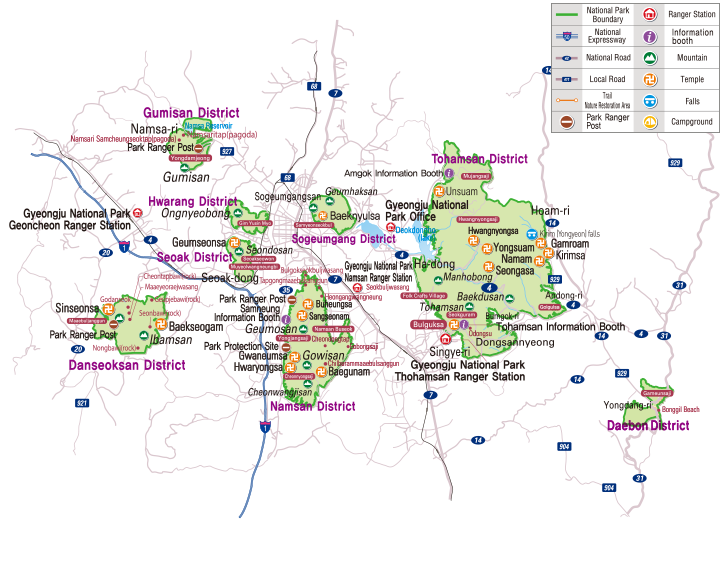 Gyeongju national Park is located in 3eups and 5 myeons of Gyeongju-si in terms of administrative area. It was originally managed by Gyeongju-si after its designation as a national park, but from 2008 the Korea National Park Service took over its management. Gyeongju National park is divided into eight districts with their own unique flora and fauna. In 2008, studies have been carried out to identify the natural resources of each district and to search for more effective ways of resource management.